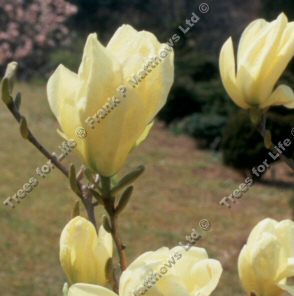 Elizabeth (Magnolia 'Elizabeth') is a charming, small conical tree with exquisite, fragrant, clear, pale primrose-yellow flowers opening before the leaves in April. First introduced in the United States but we have told it to leave its American habits there before coming to the UK so it won't pull a 9 mm on you for no reason, will not devour its body weight in sugar and use appropriate decibels at appropriate times. The RHS were so impressed with it at one time or another that they voted and gave it their Award Of Garden Merit. A good choice if you are looking for a Magnolia tree to be part of a display or park as they are often selected for this. Thin out the branches from time to time to encourage new growth. Saying nurturing things to it in low soothing tones to also promote growth has no basis in science that we know of but it couldn't hurt. For best results plant in soil that prevents the Magnolia Elizabeth getting "wet feet" as they say in the purist, cult like, exclusive, horticultural circles. You know the ones we mean, those that are close to voting in wearing of green pillow cases with eye holes cut out with pruning shears. Normal people would say select a spot with well draining soil. If you would like an instantly taller Magnolia Elizabeth, plant in a bigger container, up a slope or take the inserts out of your shoes. Most people realise trees take their sweet time growing and you just have to be patient. Will tolerate clay conditions. By that we mean when planted in the ground not when you take it to a pottery class and leave it there without being watered. Your arts and crafts absent mindedness is not covered by our tree warranty. This tree is supplied at a height of between 1.3 and 2.0 metres in a 12 litre container for year round planting and better results than from either bare-root or rootballed stock. For more information about our Magnolia Elizabeth, read this again after you have forgotten what was on this page.